As Notre Dame Cathedral burns, it isn't only Parisians feeling the weight of the flames. Catholics around the world are mourning the sight. The archbishop of New York, Timothy Dolan, told Paris it has his prayers. The Catholic Association’s Senior Fellow, Ashley McGuire, was just as devastated. 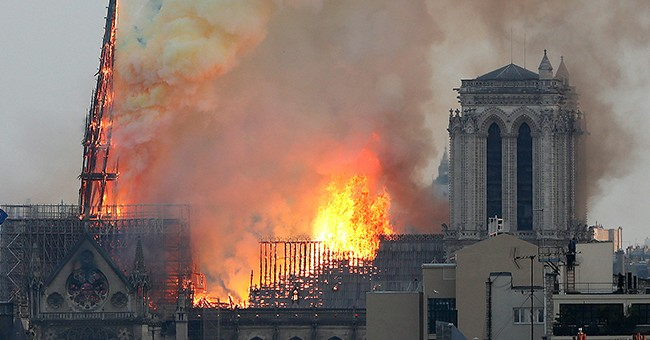 "Catholics everywhere are devastated by the destruction of Notre Dame," she wrote in a statement. "For centuries, the cathedral has been an emblem of faith and beauty, beckoning visitors from all around the globe and filling their hearts with wonder and awe at the Divine. Just as the Catholic Church is universal, the loss of Notre Dame is felt universally." Bystanders watched in horror as the Notre Dame Cathedral's famous spire collapsed, and the fire has reportedly consumed the entire roof. Groups near the cathedral have broken out in prayer. French President Emmanuel Macron has arrived at the cathedral to view the devastation before meeting with police. "Thinking of all Catholics and all French people," Macron said in a somber tweet. "Like all our compatriots, I am sad this evening to see this part of us burn." An investigation into the fire is now underway.